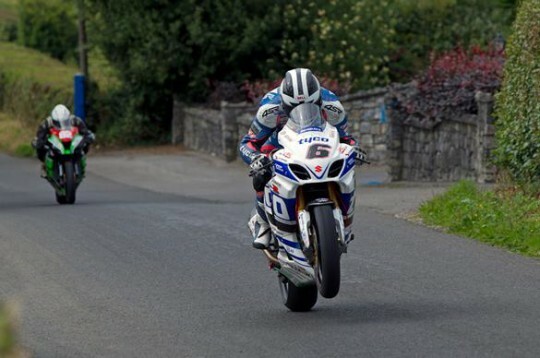 In his first outing on a Superbike since his Isle Of Man TT crash, William Dunlop on his Tyco Suzuki started the day at the Walderstown Race Of South with a victory in Open Race. In a closely fought battle in which the lead changed three times he took the win 0.679 secs ahead of second place man Derek Sheils with Michael Sweeney finishing in third. Sweeney was the quickest off the line leading the opening lap, Sheils took to the front in lap two a lead he held for two laps, before William worked his way into the lead which he held to the chequered flag. He also won the Supersport 600 Race. Derek McGee took the early lead but it didn’t take Dunlop to many laps to move to the front where he stayed to the chequered flag setting a new class lap record on the way, McGee was second and Dan Kneen third. In the Grand Final, it was Manxman Kneen on the Cookstown Burrows engineering GSX-R 1000 Suzuki who was the man on a mission. In his debut outing at Walderstown he got the perfect start leading into turn one, from there on there was no looking back taking the win by 6.5s. William Dunlop didn’t get the best of starts and was put under pressure by Sheils in the opening laps but he held his nerve and took second with Sheils just over a second behind in third.